Be available as a free, open source webfont on any platform. Have a broad range of weights and a good italic. Perform well in headlines, text, and UI. Allow for good data design with tabular figures. This entry was posted in Computer, Murmuring and tagged digital, font, franklin, free, gov, government, libre, license, open, public, sans, sil, source, states, united, us, usa, webfont on April 16, 2019 by Gea-Suan Lin. In response to the Commission’s request for information concerning Russian-funded campaign activity conducted during the regulated period for the June 2016 EU Referendum (15 April to 23 June 2016), Twitter reviewed referendum-related advertising on our platform during the relevant time period. Among the accounts that we have previously identified as likely funded from Russian sources, we have thus far identified one account—@RT_com— which promoted referendum-related content during the regulated period. $1,031.99 was spent on six referendum-related ads during the regulated period. With regard to future activity by Russian-funded accounts, on 26 October 2017, Twitter announced that it would no longer accept advertisements from RT and Sputnik and will donate the $1.9 million that RT had spent globally on advertising on Twitter to academic research into elections and civil engagement. That decision was based on a retrospective review that we initiated in the aftermath of the 2016 U.S. Presidential Elections and following the U.S. intelligence community’s conclusion that both RT and Sputnik have attempted to interfere with the election on behalf of the Russian government. Accordingly, @RT_com will not be eligible to use Twitter’s promoted products in the future. This entry was posted in Computer, Murmuring, Network, Political, Social and tagged ad, brexit, eu, government, network, political, promotion, referendum, rt, russian, social, sputnik, twitter on December 14, 2017 by Gea-Suan Lin. This entry was posted in Computer, Murmuring, Network, Political, Privacy, Security, Social, WWW and tagged certificate, gov, government, https, letsencrypt, pl, polish, privacy, security, ssl, tls, web on September 27, 2017 by Gea-Suan Lin. This entry was posted in Murmuring, Political and tagged cabinet, code, digital, gov, government, hand, kingdom, meeting, office, platform, service, uk, united on October 10, 2016 by Gea-Suan Lin. The DNA testing law that will go into effect this year is aimed at creating an integrated security database and does not include genealogical implications or affects personal freedoms and privacy. When the law (no. 78/2015) is applied, it will be binding on all citizens, expatriates and visitors too. And there is nothing preventing the Kuwaiti government from sharing that information with any other government. This entry was posted in Murmuring, Political, Social and tagged dna, government, kuwaiti, law, privacy, test on April 20, 2016 by Gea-Suan Lin. These orders are so highly classified that simply acknowledging an order's existence is illegal, even a company's chief executive or members of the board may not be told. Only those who are necessary to execute the order would know, and would be subject to the same secrecy provisions. This entry was posted in Computer, Murmuring, Security, Software and tagged code, court, fisa, government, security, software, source, us on March 22, 2016 by Gea-Suan Lin. Yes. Vinod Khosla, first President of Sun, came to me at one point and said to put something hidden, triggered in an unexpected way, into the ROM Monitor, so that if somebody cloned the Sun Workstation (violating our software’s copyright), we could do that unexpected thing to the competitor’s demo workstation at a trade show and thereby prove that they had cloned it. This entry was posted in Computer, Hardware, Murmuring, Political, Programming, Security, Social, Software and tagged boot, bootloader, but, chip, copyright, country, crypto, des, eff, gilmore, government, its, john, loader, love, never, rom, sun, system, trust, workstation, your on January 27, 2016 by Gea-Suan Lin. The Dutch government has formally opposed the introduction of backdoors in encryption products. A government position paper, published by the Ministry of Security and Justice on Monday and signed by the security and business ministers, concludes that "the government believes that it is currently not appropriate to adopt restrictive legal measures against the development, availability and use of encryption within the Netherlands." The formal position comes just months after the Dutch government approved a €500,000 ($540,000) grant to OpenSSL, the project developing the widely used open-source encryption software library. 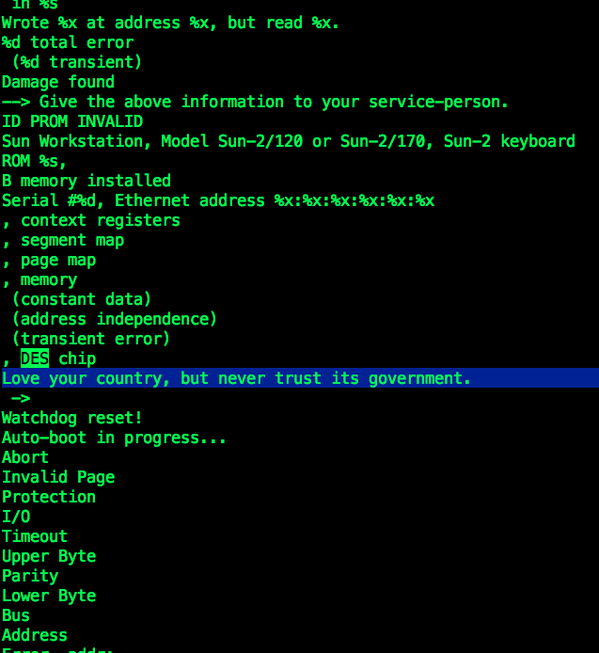 This entry was posted in Computer, Murmuring, Network, Political, Social and tagged backdoor, cryptography, dutch, government, openssl on January 6, 2016 by Gea-Suan Lin. This entry was posted in Computer, Murmuring, Network, Political, Security, Social and tagged edward, government, hbo, last, snowden, surveillance, tonight, week on April 19, 2015 by Gea-Suan Lin. This entry was posted in Computer, Hardware, Linux, Murmuring, Network, OS, Security, Software, VPN, WWW and tagged device, end, government, guidance, lts, security, ubuntu, uk, user on March 19, 2015 by Gea-Suan Lin.